Sand dunes of the Arabian desert, close to Dubai in the United Arab Emirates. Soft vintage editing. Picture taken on a desert safari. So you’ve made it to Dubai, one of the most popular tourist locations in the world. 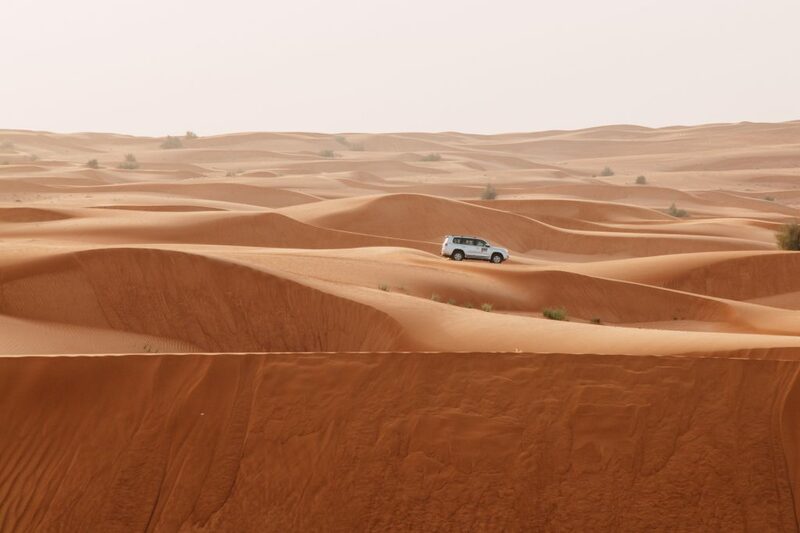 What trip to Dubai would complete without a chance to experience the desert? If you go to Dubai but you don’t book a safari, did you even go? There are many ways to ride through the dunes, but none more exhilarating than a jeep safari. In controlled amounts, sunshine is wonderful. But temperatures in the Dubai desert are nothing to play with. Venturing into the desert unprepared can be fatal. One of the many amazing perks a professional jeep safari is the team of experienced guides ready to help you brave the heat. One of the best parts of any safari is paying the professionals to worry about safety and logistics so that you don’t have to. You get to lay back and soak it all in. This term sounds a lot more violent than it is! Dune bashing is the good stuff–riding up and down over the sand dunes at high speeds on an ATV or in a jeep. It takes an enormous amount of skill and experience to safely ride up and down desert sand dunes, so you will most likely be assigned a driver. They’ll know how to let enough pressure out of the tires to get better traction on the sand. They’ll also know how and when to adjust the jeep’s speed while constantly changing angle and direction. Beyond that, it’s hard to describe with words how electrifying it is to rip across the Dubai desert on a jeep safari! This is the part you travel so far to experience first hand. As amazing as dune bashing can be, you’ll have to stop and rest at some point. The evening after a day in the desert is the perfect time for dinner and a show. Most Dubai desert safari tours include buffet meals or a BBQ in a traditional desert camp set up. Relaxing evening activities may include shisha smoking, some traditional dancing, and other activities. By the end of your safari tour, you’ll leave with so much more than sand in your shoes. You’ll have had a taste of historic desert culture. For more information about trips through the desert, check out our blog. Or, contact us if you’ve done enough reading and ready to book your jeep safari in Dubai with us today.